Felixstowe and Walton United lead the Thurlow Nunn Premier Division by a comfortable fourteen points from Coggeshall Town who could close the gap down to five points if they win the three games in hand they have over the current tale toppers. The Seasiders have won fifteen of their sixteen league games played with their only defeat being a 4-0 loss at Saffron Walden Town on Saturday 30th September. That game had twelve cautions, one red card for the home side, three penalty kicks and an own goal - reports state is wasn't even a dirty game!! Coggeshall Town, known as The Seedgrowers, were promoted from Division One last season after joining the league from the Essex and Suffolk Border League where they were Premier Division Champions and League Cup winners - It's great to see them making a come back up the pyramid after they dropped out of the Essex Senior League in 1989. Over four seasons from 1984 to 1988 (they didn't play in the 86/87 campaign) they bottom of the table on every occasion conceding 466 in 126 games played. 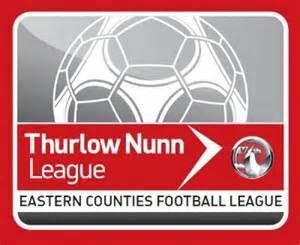 Felixstowe won the game between the two title challengers on Saturday 26th August at Coggeshall by a score of 1-2. Third placed Brantham Athletic lost 5-1 at Felixstowe on Friday 15th September but have since won six league games in a row. In the race for the golden boot Josh Mayhew of Stowmarket Town (currently in 8th place - they were champions of Division One last season) has 14 goals in 13 league games played along with Miles Powell of Fleixstowe who has 14 in 16 league games played. Mayhew played in the Isthmian Division One (North) last season for Bury Town where he scored seventeen times in forty appearances. Powell spent the second half of the 2016/17 campaign out of the game with a serious injury so United's fan's will be pleased to see him amongst the goals. At the bottom of the table it's been a disappointing season for Fakenham Town so far who have just one win and one draw from their eleven league games played. They lost at home to Hadley and Ottaway Anglian Combination Division One side Yelverton in the Norfolk Senior Cup on Saturday. Felixstowe's next three league games come away at Gorleston, away at Godmanchester Rovers and at home to Hadleigh United. They also have an interesting FA Vase game at Wisbech Town (currently 10th in the United Counties League Premier) this coming Saturday.